Loch Lomond is the largest loch in Scotland, the largest fresh water lake on the island of Great Britain and probably the most famous after Loch Ness. 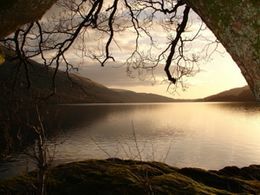 It is part of the Loch Lomond & the Trossachs National Park, Scotland's first national park. The southern end of the loch is quite flat, but the scenery soon becomes more mountainous and distinctly wild by the time you reach the north end. To the north-east lie the Trossachs with both Loch Katrine and Loch Array. Balloch -- located at the southern end of Loch Lomond, it is the main town on the loch, and can get busy. The TIC / visitors centre called Loch Lomond Shores can help you plan your stay and provide you with close-area maps. Has a railway station. Crianlarich - located about 12km beyond the northern head of Loch Lomond; the most signposted village in Scotland is a major junction for both road and rail, and is dominated by the dramatic peak of Ben More, which is one of its biggest attractions for walkers. Luss -- a town without any attractions other than its beautiful appearance and cottages, which are still worth a visit. Once famous for its connection to the now defunct TV series Take The High Road. Rowardennan - a tiny hamlet which is the last stop on the public road up the eastern shore, and makes a great base to explore Ben Lomond - Scotland's most southerly Munro. Drymen -- good base for the Conic Hill, also a nice pub (claimed to be the oldest in Scotland) and Buchanan castle. Ardlui - a small hamlet at the northern tip of the loch, best known for its marina, hotel and railway station. Loch Lomond itself has two routes that run up its shores. The main A82 Glasgow-Inverness trunk road runs up the west bank, and is a good quality single carriageway as far at the village of Tarbet, but then becomes extremely twisty and windy for the northern third of the shore. The east bank is less accessible, the small villages of Drymen and Balmaha being the two main bases for exploring the Loch’s eastern shores. The road only goes as far as Rowardennan and is barely double track beyond Balmaha: however it does provide access to Ben Lomond as well as several campsites. For anywhere beyond Rowardennan, you will need to either walk or use a boat - some of the cruise companies do call at the key points on the east bank that are north of where the road terminates. The fastest route to the Loch by far is to follow the M8 motorway through Glasgow city centre, out the other side past Glasgow Airport and exit the motorway at Junction 30 for the Erskine Bridge. This road (the A898) crosses the River Clyde and then joins the A82 westward. From here, follow the signs for Dumbarton, which then lead on to Balloch - signs for "Loch Lomond and the Trossachs National Park" should guide you to the part of the Loch which are of interest. The exception to this if you are coming from the West End of Glasgow, then it is probably quicker to follow the urban part of the A82 through Kelvinside, Anniesland and onward through Clydebank and Old Kilpatrick. Just watch out for the speed cameras along this route! For a more scenic and slower alternative (particularly if you are going to the eastern side of Loch Lomond), there are a variety of routes that exit from the north of the city via Kirkintilloch or Bearsden/Milngavie and traverse the picturesque Campsie Fells with many pleasant villages along the way. Follow the M74 motorway northbound all the way to its end until it joins the M8 just south of Glasgow city centre. From there follow the route via the Erskine Bridge as described above. There are two options - from Central Scotland/Fife, the best route is to take the A811 from Stirling (following the signs to Erskine Bridge). This will eventually bring you out at Drymen and then Balloch. From the North West, follow the A82 southbound from Inverness/Fort William, or from the North East (starting at Perth), follow the A85. Both these routes converge on Crianlarich. ScotRail operate local trains frequently from Glasgow's Queen Street Station (Low Level) (Central Low Level on Sundays) to Balloch, which is at the end of the line. The station in Balloch is easy to find. From Edinburgh, take the main 'Shuttle' service to Glasgow Queen Street (High Level), then go downstairs to Platform 8 to pick up the Balloch train described above. Alternatively, you can take the direct (but slower) train to Queen Street (Low Level), destination Helensburgh Central or Milngavie, and change to the Balloch service without having to change platforms - there is probably little difference in overall journey time. Several trains run daily up the West Highland Line between Glasgow and Oban, Fort William and Mallaig, which stop at Tarbet and Ardlui on the north-west shore as well as Crianlarich and Tyndrum in the northern part of the park. These leave from the upper level of Glasgow's Queen Street station. The Caledonian Sleeper also runs to Loch Lomond from London via Edinburgh and Glasgow Queen Street (Low Level), destination Fort William. First buses run frequently between Glasgow and Balloch, journey time around two hours each way. The bus picks up passengers at the bus stops south of the St. Enoch subway station and opposite McDonalds on Jamaica Street. A full day's unlimited travel ticket costs about 4 pounds. Citylink operate several buses a day between Glasgow and Campbeltown, Oban, and Fort William and the Isle of Skye travel along the western shore (A82) of the Loch. These will stop at all bus stops and laybys north of Balloch, including Luss, Inverbeg, Tarbet and Ardlui. Be advised that prices can be expensive if bought on the bus at the time of travel, for example a single from Balloch Roundabout to Luss can cost over six pounds. To enjoy the nature, it is best to go by bike. There's a (relatively!) well-maintained and signposted cycleway from Glasgow to Balloch called National Route 7. A good place to join it is Bells Bridge over the Clyde by the SECC (Scottish Exhibition and Conference Center). It's a fairly flat 20-25 miles. Buses run along the Loch, but not that frequently (see above). You should check the departure-times first, as timetables are not usually available at the stops. The National Park Authority publishes a timetable of all the buses and ferries  which may be available as a booklet locally. If you're driving, mind that the road along the northern part of Loch Lomond is pretty narrow for the traffic it has. Sightseeing trips by boat run from Loch Lomond Shores near Balloch. There is also a useful passenger ferry between Inverbeg (served by Citylink buses) and Rowardennan (at the foot of Ben Lomond mountain). Loch Lomond Shores, Balloch, 01389-722406. A gateway center for Loch Lomond with an information center, an educational cinema, shops and a view across the Loch. Lomond Shores Project: . Balloch Castle Country Park, Balloch. The first park in the national park with a castle you can visit. The castle itself only has two accessible rooms with only little information about the castle , but rather some educational informations about the national park. It was built in the early 20th century to replace the old castle located further down the hill, and only served as a manor house. Luss Village Paths, Luss (along the A82). A beautiful town with four walks around town and a sandy beach. A map can be picked up at Balloch TIC or at the Luss Visitor Information. Cycling is probably the best outdoor activity besides hiking. The Lowland Highland Trail, which is part of the National Cycle Network Route 7 starts from Balloch, going north to Drymen, Aberfoyle, Callander, Strathyre, Lochearnhead and Killin. Free leaflets with a map of the bike trail can be picked up at TICs along the trail. There is another cycle path along the western shores of Loch Lomond. Bikes can be hired at the Loch Lomond Shores (see above). Hiking is also a good idea. You could for example go to Rowardennan and then hike up Ben Lomond. The long-distance West Highland Way also runs along the eastern shore on its way from Milingavie (near Glasgow) to Fort William. The Clachan Inn in Drymen - Scotland's oldest registered licensed premises (1734) - nice pub with good food and friendly atmosphere. There is a small pub, with outside terrace and nearby pier for boat moorings, on the island of Inchmurrin in the centre of the loch. A ferry is available from Midross, on the A82, to the island. Cameron House Hotel has a marina bar with views over Loch Lomond. Rowardennan Youth Hostel, Rowardennan, 0870 004 1148. Located at the banks of Loch Lomond, it can be used as a base to climb Ben Lomond. £10.50-12.00/5.00-9.00 (Adult/Child). Opened March-October. SYHA information and booking: . Cameron House on Loch Lomond, A82, 01389 755565 . Cameron House on Loch Lomond is a five star Scottish Baronial Mansion on the banks of Loch Lomond. The resort has four restaurants, an 18-hole Championship golf course, a luxury resort spa with rooftop infinity pool and an available range of outdoor pursuits. Buchanan Castle, Drymen (along the A811, enter through the gate of Buchanan Castle Golf Course). A ruin of an beautiful castle, which cannot be entered (danger of falling apart). Sadly, it is not getting maintained or repaired, but is worth a peek. This page was last edited on 11 April 2019, at 08:32.